Known for her technical brilliant and startling use of light and color, Jenik Cook incorporates a plethora of references from literature, and mythology, to landscape and personal relationships. Her works form a mixed media investigation concerning the multiplicity of marginal spaces, states, emotions and spaces that exist within the emotional landscape. Cook's works, allude to a space-between, a place of ambiguity and transition, a site of passage in which borders, boundaries and thresholds are crossed. It is an indeterminate zone of interactions and exchange between Cook and the viewer. Cook, whose diverse artistic practice engages with the concept of love and liminality and their relationship to our global landscape, utilizes the strength and subtleties of paint in order to create and art based on light and movement that in turn explores color, luminosity, and sculptural space-through movement and composition. 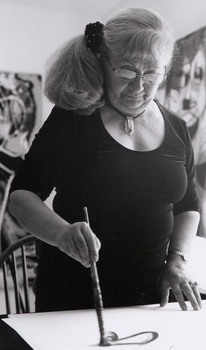 Conceiving her visual art on the canvas surface, Cook conveys inventive points of view that form a synthesis between abstract and figurative elements. Cook creates a narrative with light, utilizing abstract compositions that reveal a life within the clinical world of abstract painting. Her works deliver compelling patterns with graceful colors, methodical lines and arches, an aesthetic that can be closely identified with a deep spirituality. Working toward being an impulse to change, with creative energy, and inspiration, she brings her knowledge of painting, sculpture and the arts to every piece. At its core her art is an experiment of movement, light, contemplation and ritual, each perfectly composed in order to touch the viewer on a more profound level.